The majority of dogs are friendly pets who enjoy meeting new people, but even a friendly dog can bite in certain situations. Often when someone is bitten, it is by a dog that is well known to them—the family dog or a neighbours dog, for example. Often the bite is accidental and happens during excited play. However, sometimes a dog will bite on purpose—out of fear or aggression. Dog bites are not common, but they do occur, so it is important that everyone (especially children) should know how to act around dogs in order to minimize the chances of a bite. Most dogs are companion pets and enjoy meeting and playing with new people. But even a friendly dog may bite if it feels the need to defend itself or if it is frightened or hurt. Some dogs are afraid of children or strangers. These dogs show their fear by whining, barking, growling, or even lunging and biting at the person they are afraid of. 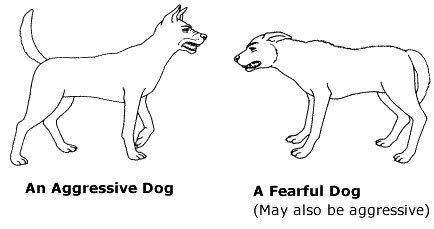 Fearful dogs may bite if they feel threatened or cornered. Dogs may also bite out of protectiveness—of things like food, favourite toys or their own space. Dogs will often defend their eating and sleeping areas. They may also defend their yards and porches and their owner’s cars. It’s important to be aware of situations that might provoke or frighten a dog. Reaching through a fence or arriving unannounced at the door can turn a friendly pet into a growling protector. • DO NOT try to pet or comfort a dog that seems frightened or injured or approach a stray or threatening dog. • CALL the local SPCA or the CRD animal control officer instead. Dogs send messages with their body language and facial expressions. It’s important to recognize these messages and know how to respond in the right way. • The face will be relaxed and the ears will be forward. giving the impression of smiling. • The eyes will be bright and the tail will be wagging. • Low growling or barking. • The ears may be standing up tall or held back. • Never approach a strange dog without permission from the owner. • Approach a dog slowly with the back of the hand extended. • Curl your fingers and allow the dog to sniff. • Stroke the dog gently on the chest or shoulder, or under the chin. • Do not pat the dog on the top of the head. • Avoid approaching dogs that are sleeping or eating. • Stand still like a fence post if approached by a strange dog; do not squeal or jump, or wave your arms. • Avoid making direct eye contact with the dog, as this may be interpreted as an act of aggression. Staring directly at a dog that appears unfriendly can make the situation worse. A dog interprets a direct stare as a threat. Do not run away, wave your arms or move in a way that may challenge the dog to defend itself. • Blink your eyes slowly and yawn (these are calming signals for dogs). • Turn your head to the side and stand still with your arms at your side. • Do not turn your back on the dog. Walk away backwards or sideways. BE CONSIDERATE: remember that owners can be held liable for their dogs’ actions—including biting. • Socialize and train your dog from the time it’s a puppy so it knows how to behave with strangers. • Never allow your dog to run up to unknown people or dogs. • Leash your dog when you’re in crowds. • Make sure your dog gets plenty of exercise. • Do not let your dog play off-leash until it is well socialized and under effective voice control. • When you meet children and strangers, let them know how to approach your dog properly. 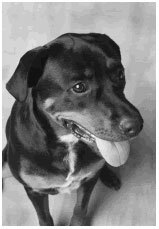 • Find help from a qualified trainer if your dog is fearful or aggressive.